This week I want to return to specifically genetic drift (as opposed to drift in general). First, a bit of history. Back in 1984 there was a pair of competing articles on founder event speciation. In that exchange Barton and Charlesworth (1984. Annual Review of Ecology and Systematics 15: 133-164) responding to Carson and Templeton (1984 Annual Review of Ecology and Systematics 15: 97-131) make the claim that genetic drift does little more than deplete genetic variance, and reduce the number of alleles. Based on the additive models that were available at the time they were exactly right. 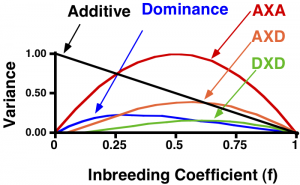 Genetic drift increases Wright’s inbreeding coefficient, and with it decreases the additive genetic variance. In this additive world drift decreases the ability of a population to adapt and respond to selection. Shortly after this exchange took place I published the first of my papers on epistasis and drift. It is worth looking at how these models can change our perspective on the importance of drift. Additive genetic variance is a statistical property of a population. Thus, as gene frequencies change so does the additive genetic variance. See Falconer and MacKay’s Quantitative Genetics (1996) ( $250.00, are you kidding me?) for a derivation of the dominance situation. For the epistatic situation the simplest form of epistasis is additive-by-additive (AXA) epistasis. For this form of epistasis the additive genetic variance is simply the variance of the marginals (this doesn’t work if there is dominance). 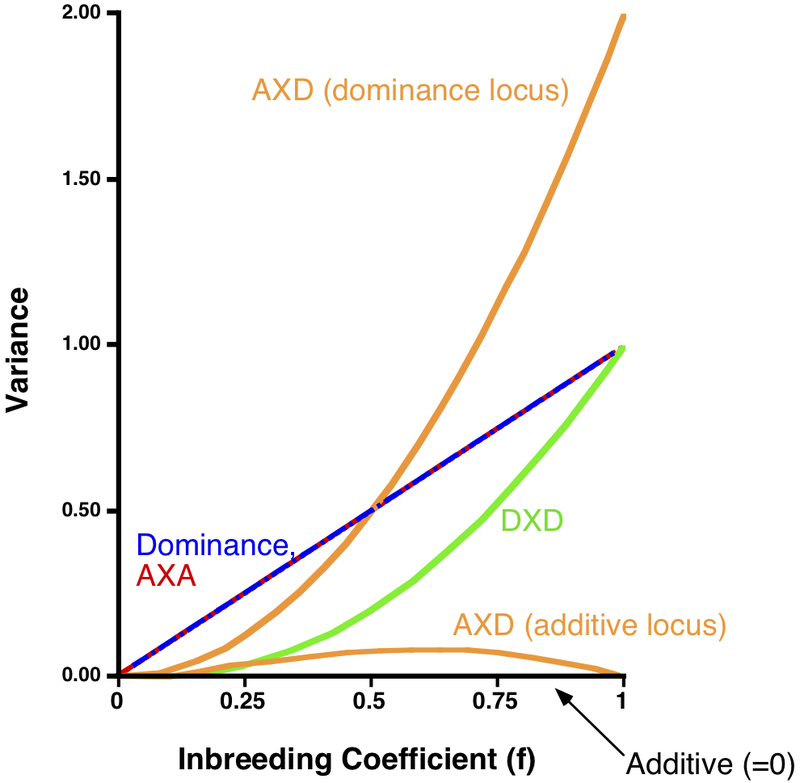 This is AXA epistasis because both loci are additive (1, 0, -1), but the direction of effects is a function of the genotype at the interacting locus. Note that at a gene frequency of 0.5 the marginals, and with it the additive genetic variance, is zero. If the gene frequency for both loci changes of 0.75 the marginals change as well, and there is additive genetic variance. In other words, when there is epistasis changing the gene frequency changes the proportion of the total genotypic variance that is expressed as additive genetic variance. It turns out that with a two-locus two-allele system there are 9 cells, which means 8 independent genetic effects. These are Additive A locus, Additive B locus, Dominance A locus, dominance B locus, AXA epistasis, additive-by-dominance and dominance-by-additive (AXD) epistasis, and dominance-by-dominance (DXD) epistasis (Goodnight, C. J. 2000, Modeling gene interaction in structured populations. Epistasis and the evolutionary process. Wolf et al eds.). These effects are simply numbers filled in as “genotypic values” for each of the nine genotypes. The genetic variance components are determined by doing a regression of phenotype on genotype that is weighted by the genotypic frequencies. 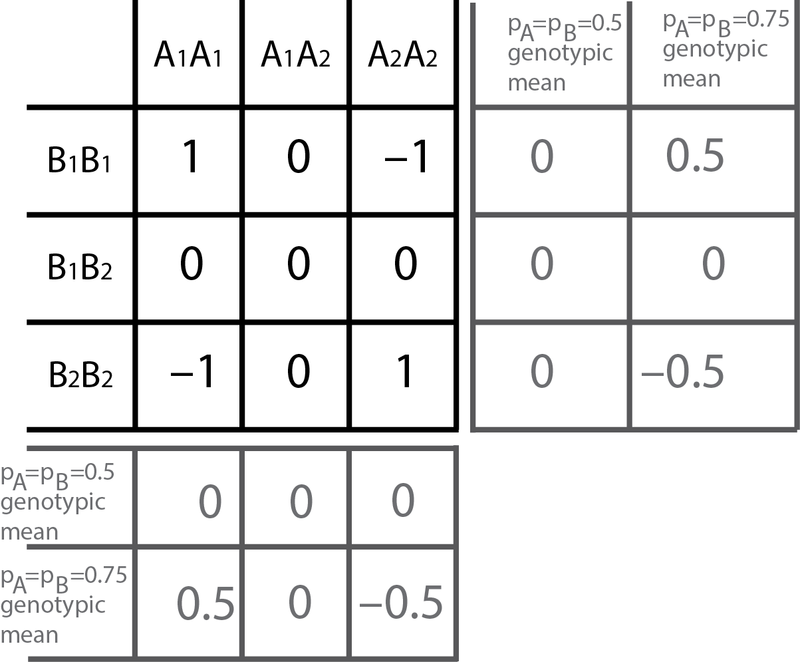 As a result any given pattern of genotypic values will partition into different variance components, and the partitioning will depend on the gene frequency. In the system I use, at a gene frequency of 0.5 each of the types of epistasis will be expressed only as its variance component. Thus, as shown in the example above, at a gene frequency of 0.5 AXA epistasis has only AXA epistatic variance. At other gene frequencies it will be a mix of AXA and additive variance. One of the best ways to look at this is using Wright’s inbreeding coefficient, f. f is formally the correlation between the gametes that combine to form an individual, but it is often convenient to think of it as the probability that two alleles are identical by descent. If we start at a gene frequency of 0.5, gene frequencies will change randomly, but the inbreeding coefficient will increase in a regular and predictable manner. Shown below is the expected additive genetic variance for each of these pure forms of genetic variance. It can be applied to “real” values of pairs of QTL easily. The general method is described in the epistasis chapter cited above. When I first identified that drift could increase additive genetic variance I found it a bit disconcerting. Additive genetic variance is the variance in the average effects of alleles (yes, I know the formal definition is a bit different), and nothing magical. 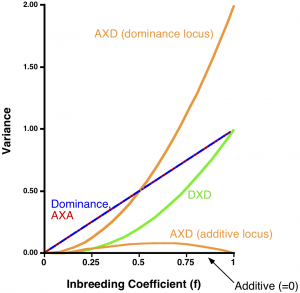 There are only two ways that the additive genetic variance can increase. One is to increase the number of alleles (drift emphatically does not do that), and the other is to change the average effects of alleles, and not just to change them, but to make them more different from each other. 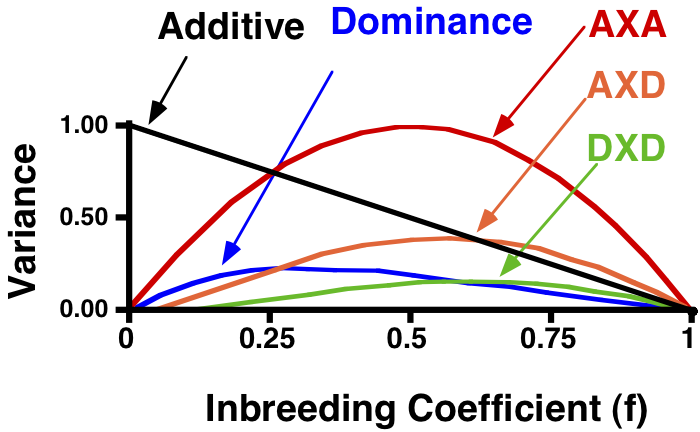 Since increasing f, by definition, decreases the effective number of alleles, drift must be increasing the additive genetic variance by spreading the average effects of alleles. What I found was that when there is gene interaction genetic drift does indeed spread the average effects of alleles, but more importantly in the process it shuffles the average effects. 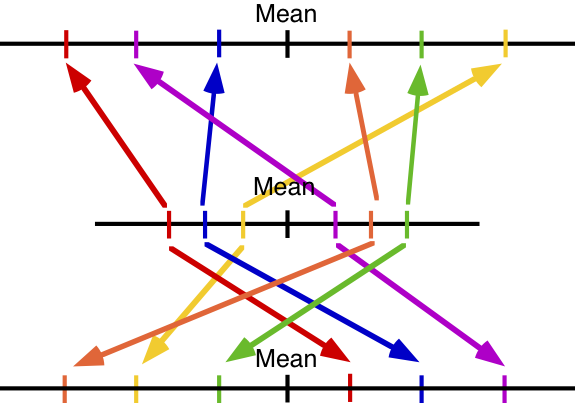 In the figure below think of the middle line as the ancestral population, and the colored slash marks on the line the average effects of different alleles on an arbitrary scale. The top and bottom line are two populations derived by founder events, and periods genetic drift. Note that in both of the derived populations the additive genetic variance (length of the line) has increased, and the rank order of the alleles has been shuffled. More importantly, the rank order has been shuffled differently in the two populations, such that an allele that is “good” in one population may be “bad” in another population. I found that a good way to measure this effect was to look at the “variance in local average effects (LAE) (Goodnight, C. J. 1988. Evolution 42: 441-454). It turns out that in the traditional linear additive model the variance in LAE is zero, whereas when there is gene interaction it is non-zero. 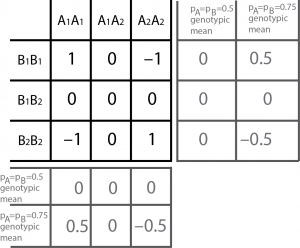 If the variance in LAE is zero it means that the relative difference between two alleles in their effect on phenotype will be the same regardless of what population they are measured in. If it is non-zero then the relative difference in the effect of the two alleles will change as you move from population to population. So, I think there are two important implications to think about. The first is that perhaps the old masters such as Mayr and Carson were on to something. They were great naturalists and believed that founder events were important in speciation. Theoreticians come along and tell them they are wrong because their models say that drift cannot cause important evolutionary effects. Later we discover that simply adding gene interaction changes everything, and perhaps drift can do something important. The lesson in my mind is that when theory and data are in disagreement then the theory is wrong, and it is the modelers job to figure out WHY their models don’t work. The second is that this has important things to say about the genic view of evolution. What we see is that whether a gene is good or bad often depends on the genetic context in which it is found. In the AXA example the A1 gene is good in a population fixed for the B1 gene, but bad in a population fixed for the B2 gene. It also shows why assigning fitness to genes is doomed to failure (I love that phrase. I lifted it from Falconer). In any given population we can go through the mathematical exercise of assigning a fitness to each allele at each locus, however we will discover that this assignment is critically dependent on the frequencies at other loci, and it will change in an unpredictable way as the details of the genotypic distribution change. That is, the fitnesses assigned to individual genes will have no predictive power, and will change from generation to generation. This entry was posted on Wednesday, July 31st, 2013 at 7:09 am and is filed under Uncategorized. You can follow any responses to this entry through the RSS 2.0 feed. You can leave a response, or trackback from your own site. “I guess that should be ‘allele’.” Yes, thanks. I have fixed it. Yes, it is easy enough to start at any gene frequency you wish. 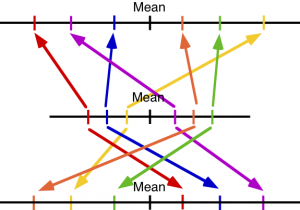 For Markov drift models 0.5 is traditional, which is why that is all I have published. That said, it is probably true that most loci are dominated by one allele with other alleles at low frequency (I have no basis for that statement). In that case starting far away from a gene frequency of 0.5 makes sense. What you would find is that most of the variance was additive, and the epistatic variance would be very small. It really says that measuring variance components within populations can be very misleading. […] a population that is “good” in one population may be “bad” in another population. I guess that should be “allele”. Have you also modelled the change in Va starting from allele frequencies other than 0.5? What would happen if there are lots of rare alleles, some of which are swept up to high frequencies? Typically that would increase Va, but does epistasis affect that too?